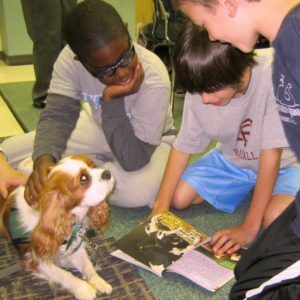 PetPalsNC, Inc. promotes and supports the use of animal-assisted therapy and activities for K-12 students to enhance academic, social, emotional, and behavioral growth. We currently serve multiple schools in North Carolina within Orange County, Chapel Hill – Carrboro, and Durham districts . . . and we have numerous requests for new teams, so we hope to raise funds needed to continue our growth. We do not certify or train therapy animals; instead, we recruit certified pet therapy teams to work with children and adolescents in schools, and we offer information, support, and guidance to the handlers as well as to the participating schools. Our goal is to provide animal-assisted intervention that targets a student’s specific need or challenge. School counselors or social workers serve as PetPalsNC liaisons in each participating school. They or other school professionals refer students to work with the dogs, help to plan the interventions, and they might direct the sessions, while the handler’s role is to facilitate the interaction between the dog and the student. In 2007 Wendy Stewart, a licensed clinical social worker who worked as a social worker for Orange County Schools researched pet-assisted therapy as a possible way to better reach students in a non-traditional high school. Wendy became certified as a Team with Ella, a rescued mix, followed by Julius and Foster. All three therapy dogs rotated days, working with students in both of Wendy’s assigned schools. As word spread about the good things that were happening with the dogs, other schools requested therapy dogs, and in 2010 Wendy established “Pet Pals” as a program and began to recruit other therapy teams from the community to place in those schools. Wendy retired in 2014 from the school district and set to work to grow the program. In early 2016, PetPals NC was incorporated and received 501(c)3 status. Defined as a purposeful interaction between an individual or group and a trained animal to achieve any number of benefits and/or goals. The animal and handler act as a Team and must be registered and/or certified and maintain membership in one of the pet therapy organizations such as Pet Partners, TDI, Alliance of Therapy Dogs, and Love on a Leash. These screen, evaluate, and insure, but do not train the animals. Pets other than dogs can be certified by some organizations. At the moment, only teams with dogs participate with PetPalsNC at present time, but we are open to including other certified animals such as cats. The therapeutic use of animals in work with humans has a long history, and its popularity is steadily increasing. Therapy animals are being used almost everywhere such as after critical incidents and disasters, in hospitals, assisted living centers and nursing homes, court rooms, airports, rehab centers, veterans’ programs, trauma centers, psychiatric facilities, hospice, workplaces, and schools. In educational settings, therapy pets not only work in elementary and secondary schools, but also in universities and colleges to help students de-stress with dogs before exams. Many of the PetPals dogs are called to Duke, UNC, and other campuses to work with hundreds of students. Why use therapy animals in schools? Pets do not discriminate, judge, laugh or criticize. They are excellent, attentive listeners. They help students to focus. They encourage relaxation and lower blood pressure. They help to promote schools as caring and compassionate. What do pets do in schools? Services provided are called Animal-Assisted Activities (AAA) and Animal-Assisted Therapy (AAT), both similar, but AAT is more involved (specifically planned interventions that are goal-directed, designed for a particular student, and progress is measured). Students can be worked with individually, or in small or large groups. Whole classrooms might be involved, such as in presentations about animal care or humane education. Depending on the task, work can take place in the classroom, in offices, or outside. – Practice teaching the animal something new using sequencing. Come support PetPalsNC as we participate in the 2019 Great Human Race! The Human Race is a national 5K Run & Community Walk benefitting nonprofits—this is the largest collective fundraising event in the Triangle. The event will take place on Saturday, March 23, 2019 at the Durham Bulls Athletic Park. There’s something for everyone! In addition to the 5K Run & Walk, there will be an Animal Walk and .5K Kid Dash—as well as plenty of local entertainment! Runners can use our promo code that will also help support us. To learn more about the race and register, follow this link: https://runsignup.com/thegreathumanrace. Be sure to use our promo code PPNC2019. We will receive a rebate for every runner registration using our code! 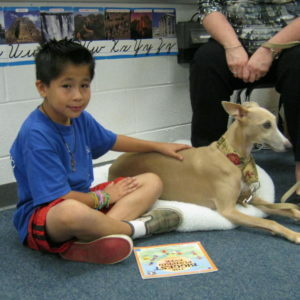 My student often stutters when reading aloud, but didn’t stutter once when reading to the therapy dog. In addition to reading, my dog has had a poem written for him and a private recorder concert. I find that the kids love to call him to “come.” It’s about having self confidence and a simple relationship with another being. Spending time with the therapy dog is helping my child overcome her fear of dogs. A student with autism who rarely speaks is comfortable speaking to the therapy dog. I feel relaxed when I am working with a therapy dog because I am having fun! Did you know your purchases can make a difference? AmazonSmile donates to PetPalsNC, Incorporated when you do your holiday shopping at smile.amazon.com/ch/81-1017847.